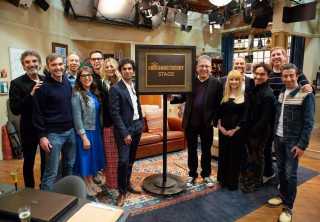 Executive producers Chuck Lorre and Steve Holland, series stars Kevin Sussman, Mayim Bialik, Jim Parsons, Kaley Cuoco and Kunal Nayyar; executive producer Bill Prady; series star Melissa Rauch; executive producer Steven Molaro; series star Johnny Galecki; director Mark Cendrowski; series star Simon Helberg. Series star Kaley Cuoco, executive producers Steven Molaro and Chuck Lorre, series stars Melissa Rauch, Kunal Nayyar, Mayim Bialik, Simon Helberg, Johnny Galecki and Jim Parsons; executive producer Bill Prady; series star Kevin Sussman. Next articleLesbians unite! Stacy Leigh’s Paintings Question both Straight and Lesbian Love and We Cannot Get Enough.